Eyeshadow is easily my favourite part of my make-up routine. I always love to experiement play around with my look, despite the fact I still haven’t nailed the smoky eye. My Naked Basics Palette is my go-to palette for everyday, particularly when I’m at school. I like to use venus as a highlight in my inner corner and brow bone, Foxy or Walk Of Shame over my whole lid then Naked 2 or Faint in the crease. The Avon Quad in Mocha Latte is something I haven’t used for a while now but this is a brilliant budget palette for a smokey eye. It has the progression of shades which make it easy for any newbie to follow and have a pretty bronze smoky look. 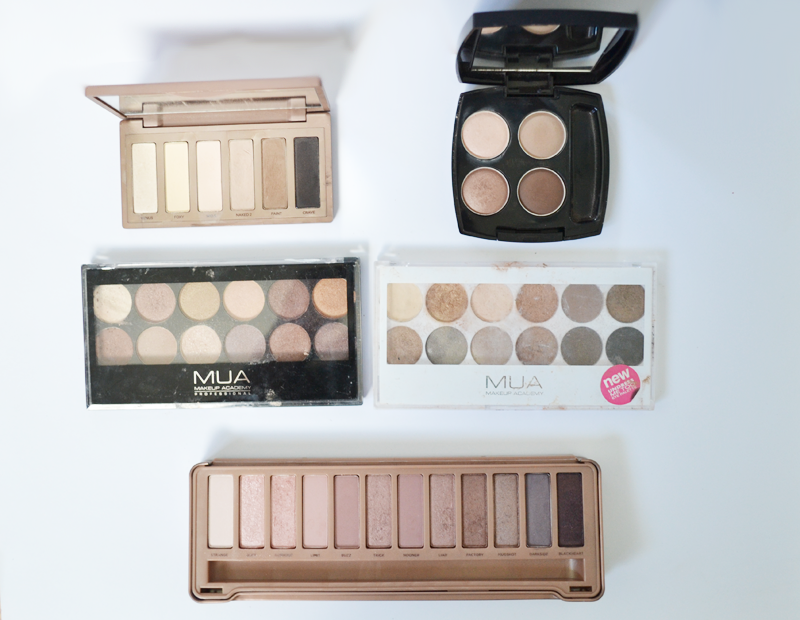 Both the Mua Heaven and Earth Palette and Undress Me Too Palette are cheap Urban Decay Dupes, great for anyone starting out and wanting to experiment. Brilliant quality for their cheap price and a vast range of shades. My favourite palette is of course my Naked 3 Palette. I wasn’t sure on the pinky shades at first but I do really love it and find myself reaching for it a lot, The left hand side of the palette is perfect for every day, and the right side is brilliant to add to, to make a smoky eye for evening. I also love the fact it has few of my favourite bronzey shades in there. Only one more week to go for Lucy’s Make-up! Next Friday I have the last component to a face of make-up – lips! What eyeshadows are your favourite?